On September 14, Reverend Jesse Jackson spoke at Old Cabell Hall to discuss “healing and rebuilding” in Charlottesville, in the aftermath of the August 11th and 12th “Unite the Right” rally and counter protest. Reverend Jackson’s speech issued a call to action from everyone in the auditorium to register to vote so that citizens can participate in the upcoming Special and General Election November 7 as a step towards change. Before Reverend Jackson spoke to the University, Orphée Noir had the opportunity to ask him his opinions about issues leading up to the rally and how Charlottesville residents and students should move forward. The “Unite the Right” rally came together as a result of City Council’s February vote to remove the Robert E. Lee statue in Emancipation Park (formerly known as “Lee Park”). The protesters came from around the United States and Canada to defend the statues. They also came as self-proclaimed white supremacists and neo-Nazis. Reverend Jackson said the Lee statue should be removed not only for the pain it represents in America, but also for its hypocrisy. Reverend Jackson said that the protesters who came to Charlottesville had a new boldness that has not been seen in the past. On September 12, a protest took place on the rotunda in remembrance of the events that occurred a month ago. In doing so, a black cloak was thrown over the statue of the founder of the University of Virginia, Thomas Jefferson. The act was condemned by University President, Teresa Sullivan. The cloak caused conflicting feelings, but when asked what his thoughts were on the controversy, Reverend Jackson said Thomas Jefferson should be regarded as a separate issue. However, Reverend Jackson’s main advice on how to make a difference was for everyone to vote. Reverend Jackson is advocating for automatic voter registration at the age of 18 for all U.S. citizens. The upcoming general election will decide who will be the next governor of Virginia and determine the future of confederate statues in the state, but Reverend Jackson also points out other topics that the election will affect such as medicaid and medicare, student loan debt, and the fate of ex-felons. UVa Alumni and member of the Lambda Zeta Chapter of Omega Psi Phi, Stafford Brown, passing out voter registration forms to students. Photo by Brianna Hamblin. Reverend Jackson mentioned many of the same sentiments in his speech to the University that afternoon. At the end of his speech, student volunteers from the Lambda Zeta Chapter of Omega Psi Phi and the LPJ Student Funding Committee passed out voter registration forms. Reverend Jackson urged all University students, no matter what city or state they were originally from, to register to vote in Charlottesville. 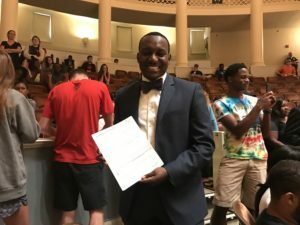 He asked for students to repeat after him: “If I live in Charlottesville, I can vote in Charlottesville.” The last day to register to vote is October 16. Reverend Jackson also called on students to start a University chapter of his social activist nonprofit, the Rainbow PUSH Coalition. 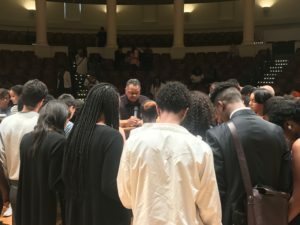 Reverend Jesse Jackson praying with students at the end of his speech. Photo by Brianna Hamblin.